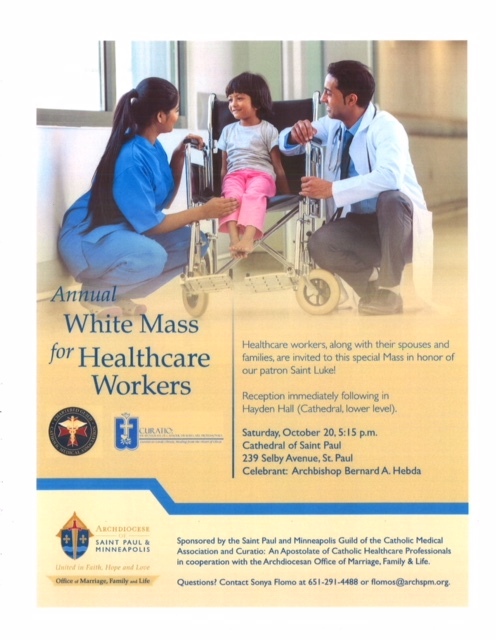 Healthcare workers, along with their spouses and families, are invited to this special Mass in honor of our patron Saint Luke! Archbishop Bernard Hebda will be the celebrant. Reception immediately following in Hayden Hall (Cathedral, lower level). Sponsored by the Saint Paul and Minneapolis Guild of the Catholic Medical Association and Curatio: An Apostolate of Catholic Healthcare Professionals in cooperation with the archdiocesan Office of Marriage, Family and Life.